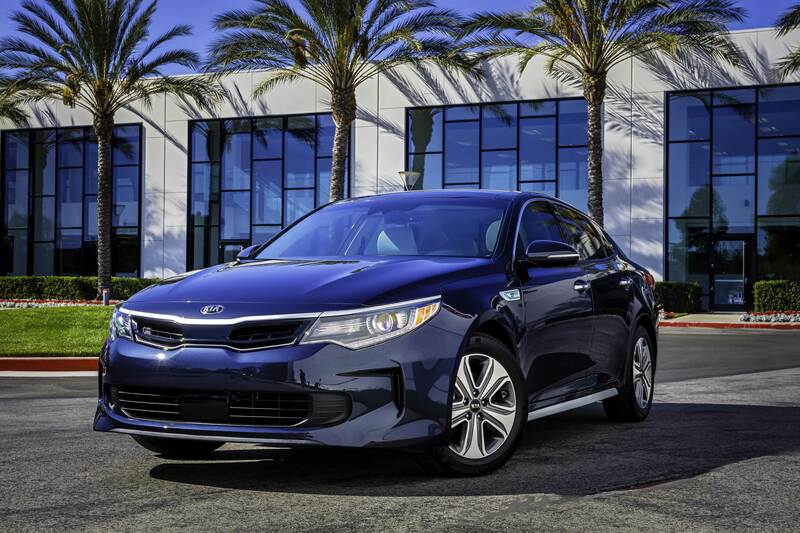 Kia Motors America (KMA) today unveiled the 2017 Kia Optima Hybrid (HEV) at the Chicago Auto Show. 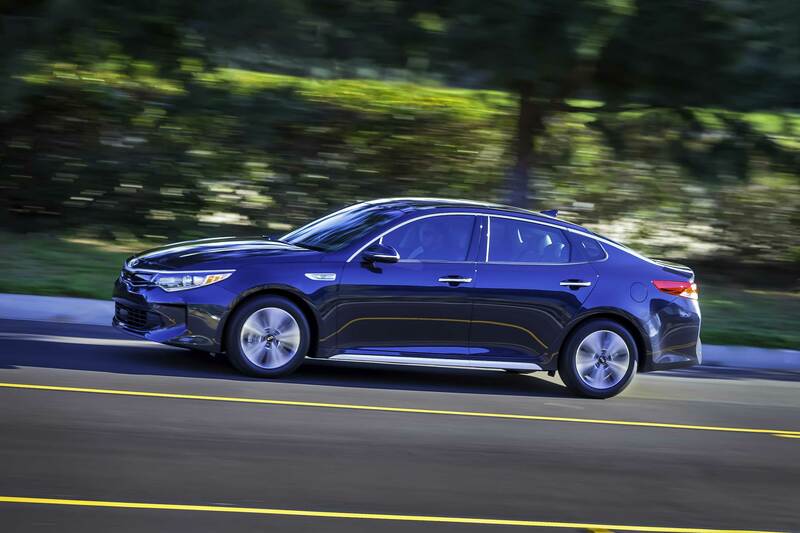 The Optima HEV enjoys the same full redesign – inside and out – as the conventional gas-powered model, the all-new fourth-generation Optima sedan, bringing with it a new hybrid powertrain that targets a 10 percent improvement in fuel economy over the outgoing model. The enhanced HEV blends modern styling and a premium driving experience with an even more intense focus on efficiency and is being introduced under the Kia Motors EcoDynamics environmentally friendly sub-brand. 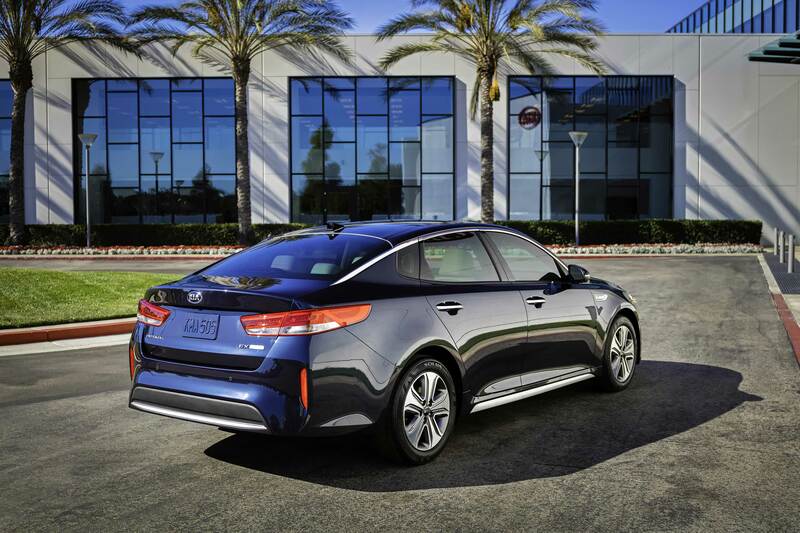 Targeting a 10 percent increase in fuel economy, the Optima Hybrid replaces the previous generation’s 2.4-liter engine with an efficient and compact 2.0-liter GDI four cylinder – estimated at 154 horsepower – coupled with a hybrid starter generator and tied to an upgraded, smooth-shifting six-speed transmission. A 38 kW electric motor and clutch replaces the traditional torque converter to provide strong off-the-line acceleration and power assistance to the engine when necessary. Energy flow is fast and seamless between EV mode and hybrid mode. 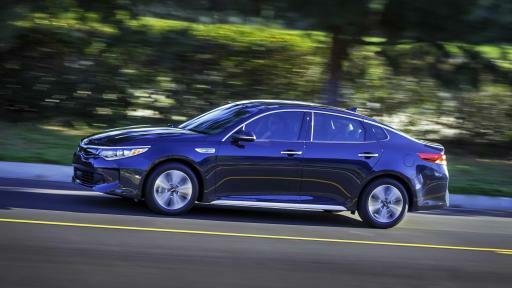 Total combined output for the Optima Hybrid is estimated at a robust 193 horsepower at 6,000 rpm. Also adding to the equation is a new electric water pump and a new electric oil pump, which help improve overall fuel economy. All-new Eco-DAS1 (Driver Assistance System) features Kia’s first application of Coasting Guide. This feature aims at maximizing fuel economy by essentially coaching the driver on when to coast and brake via an icon in the Instrument Panel that blinks for four-seconds and sounds a one-time audible alert. 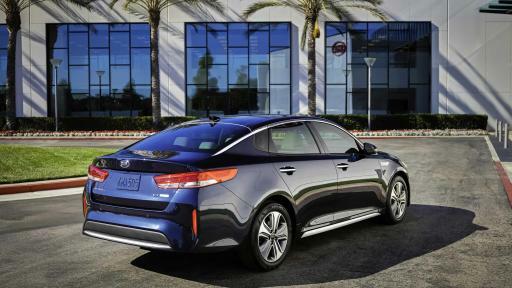 Although the new Hybrid boasts the same bold styling as the redesigned 2016 Optima, it offers distinctive design features and exterior elements that differentiate it from the gas-powered models in the Optima range, while also achieving a coefficient of drag that is among the lowest in the segment at 0.24 Cd. Featuring an active grille, which automatically opens and closes at high and low speeds, the Hybrid is able to improve aerodynamics while optimizing engine bay cooling. Numerous other styling differences include a model-specific front air curtain, a beveled rear bumper, a rear diffuser designed to streamline airflow by shrouding the exhaust tip, and an aerodynamic alloy-wheel design. These are complemented by modern LED lighting, satin finish accent trim and special ‘EcoHybrid’ badging. The new Optima Hybrid makes intelligent use of technology to deliver a host of comprehensive driver assistance systems and convenience features. The HEV now offers Autonomous Emergency Braking (AEB)2, which, under appropriate conditions, will bring the vehicle to a complete stop to potentially avoid a collision or reduce damage. Other key driver assistance systems include Blind Spot Detection (BSD), Advanced Smart Cruise Control (ASCC), Lane Departure Warning System (LDWS) and Front Collision Warning System (FCWS)2. 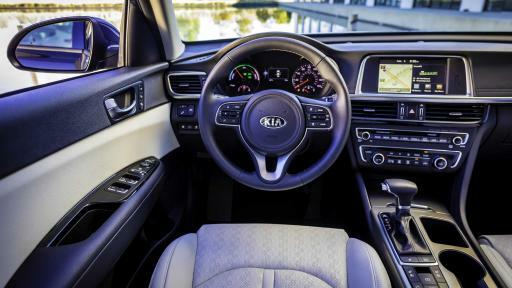 Kia’s cutting-edge connectivity system with smartphone-projected navigation, UVO33, comes standard with UVO telematics, and is enhanced with Android4 Auto™ and Apple5 CarPlay®, which allow drivers to access a suite of core functions from their smartphones. There’s also an upgraded AVN 4.0 Navigation system combined with the Harman/Kardon QuantumLogic™ Premium Surround Sound Audio System6, which includes 10 speakers, Clari-Fi™7 technology and a 630-watt digital amplifier. Clari-Fi is a patented music restoration technology that rebuilds audio signals that are lost in the digital compression process. 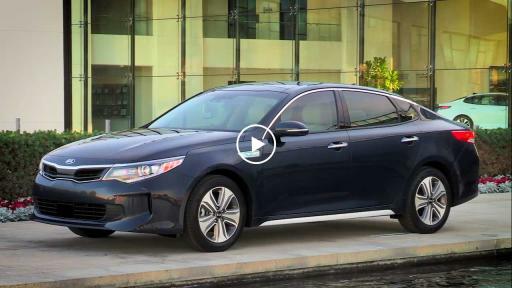 The Optima Hybrid’s passenger compartment is larger and more comfortable with an innovative and functional cabin that is well-appointed with class-up touches. 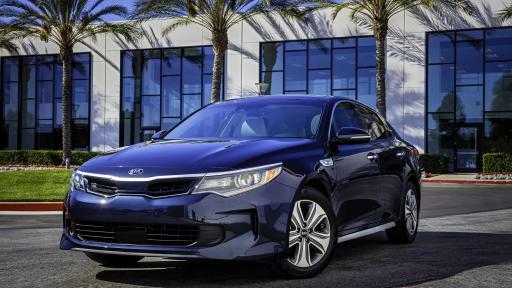 Drawing inspiration from Kia’s premium sedans, the Optima Hybrid features its own model-specific instrument panel gauges and utilizes more soft-touch materials throughout. Obsessively crafted with an impressive attention to detail, the interior features real stitching along the dash and doors. Overall, the driver-oriented cabin has been simplified with a cleaner, more unified design than the previous generation. A stronger horizontal plane and a wider center console help create a greater sense of space. 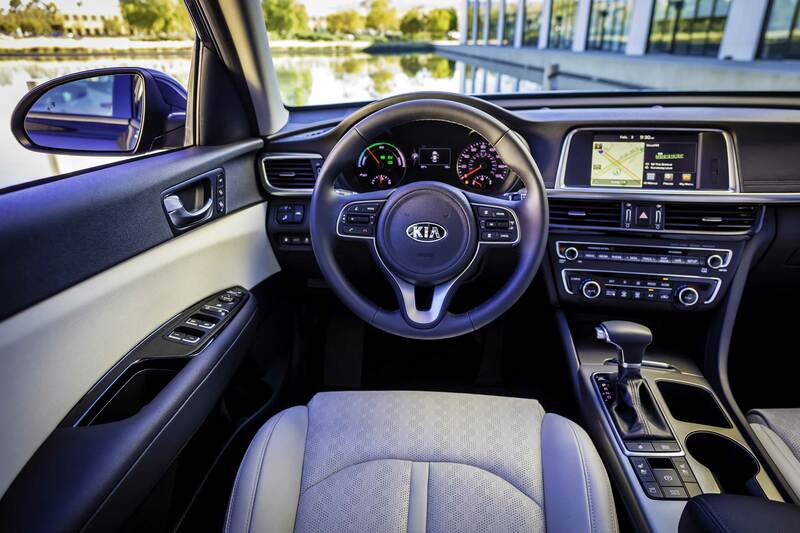 By grouping and reducing the number of functional keys and buttons, Kia’s already-superior ergonomics are markedly improved. Kia Motors America (KMA) is the marketing and distribution arm of Kia Motors Corporation based in Seoul, South Korea. KMA proudly serves as the "Official Automotive Partner" of the NBA and LPGA and set an all-time annual sales record in 2015, surpassing the 600,000 unit mark for the first time in company history. KMA offers a complete line of vehicles, including the rear-drive K9008 flagship sedan, Cadenza premium sedan, Sorento CUV, Soul urban passenger vehicle, Soul Electric Vehicle9, Sportage compact CUV, Optima midsize sedan, Optima Hybrid, the Forte compact sedan, Forte5 and Forte Koup, Rio and Rio 5-door subcompacts and the Sedona midsize multi-purpose vehicle, through a network of more than 765 dealers across the United States. Kia’s U.S. manufacturing plant in West Point, Georgia, builds the Optima* and Sorento* and is responsible for the creation of more than 15,000 plant and supplier jobs. 2 These features are not substitutes for safe driving and may not detect all objects around vehicle. Always drive safely and use caution. 3 Distracted driving can result in a loss of vehicle control. Never use a handheld device or vehicle system that takes your focus away from safe vehicle operation. Requires compatible smartphone. App uses your smartphone data service. Normal cellular service rates will apply. 4 Android™ is a trademark of Google, Inc.
5 Apple® is a registered trademark of Apple Inc.
6 Registered trademark of Harman International Industries, Inc.
7 Clari-Fi™ and QuantumLogic™ are trademarks of Harman International Industries, Inc.
8 K900 available in select trims and in select markets with limited availability. 9 Soul EV in select markets with limited availability.